Ever wondered what comes out after dark on the ANU campus? REBECCA BLACKBURN investigates. Walk around campus late at night and the only signs of life are likely to be a possum fossicking in a rubbish bin or a tired PhD student trudging home. But Brushtail Possums are not the only animals living on campus – in the darkness lurks a whole world of creatures. To find a Sugar Glider and Ringtail Possum right near the city was amazing. To find out what animals call ANU home, a group of students from the Fenner School of Environment and Society set up 20 cameras, which they monitored over a four-day period. They were surprised to find 10 mammals, of which five were native, including a Sugar Glider, Common Ringtail Possum, Rakali (Water Rat), Swamp Wallaby and the Common Brushtail Possum. “To find a Sugar Glider and Ringtail Possum right near the city was amazing,” says Dr Philip Gibbons, Associate Professor at the Fenner School. The Sugar Glider was found in a far corner of campus near the lake, in a biodiversity hotspot. “While this area had lots of introduced plants, it’s a complex habitat and is far away from lights and people,” says Gibbons. Sugar Gliders have a black stripe down their back and are so small they can fit into the palm of your hand. While reasonably common in undisturbed bush around Canberra, they are not usually found in built-up areas. The Ringtail Possum was found in shrubbery near the Research School of Physics and Engineering. Smaller and cuter than a Brushtail, ringtails live in dens in tree hollows or they make dreys out of sticks in thick vegetation.The Rakali, one of Australia’s largest rodents, was found near Sullivans Creek. Impatient to be photographed, it didn’t wait until night before making an appearance. While the camera was being installed, a Rakali climbed out of the water, sniffed the tuna oil impregnated tile and attempted to drag it away. 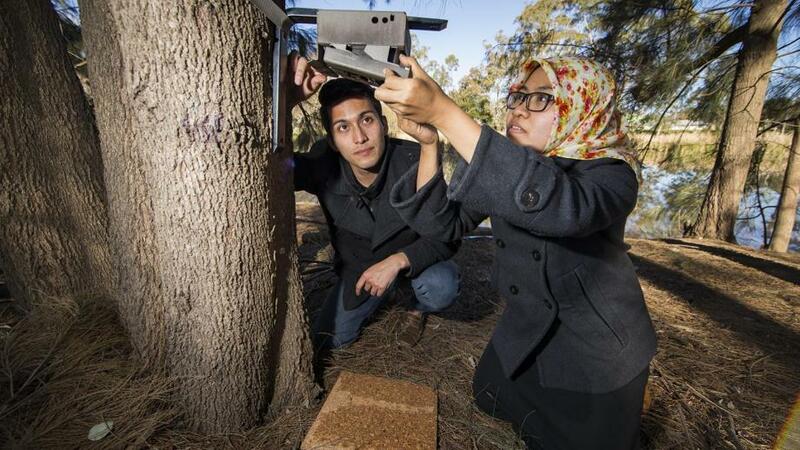 To find where the animals live, the students installed the infrared cameras in different parts of campus – thick vegetation, open grassland and built-up areas. They programmed the cameras to take three rapid photos whenever the movement sensor was triggered. The students found more mammal species occurred where there were more trees, shrubs and organic litter. Not surprisingly, fewer mammals were found where there was open lawn or buildings. Gibbons is enthusiastic about the possibilities of using infrared cameras. “The cameras are as effective as live trapping for nearly all species according to a comparison study my students have done at Booderee National Park in Jervis Bay,” he says. “They are ideal for presence/absence surveys and can be left in the field for up to three months, after which the battery needs recharging, unlike live traps which need to be checked early every morning. The animals do not even notice they are being photographed. They might even become internet stars of a citizen science project such as ABC’s Wildlife Spotter. Published in the ANU Reporter Vol 47 Number 4 2016.